← “Buckwild” — the Appalachian rasslin’ and muddin’ and partyin’ brand! If you’re thinking about going to back to school, I bet you’re full of excitement — mixed with a little bit of uncertainty. I know I was when I went back in 2010 after a good decade in the work force. What is life on the inside going to be like? How am I going to manage all my responsibilities? But it needn’t be so daunting an experience. Here are a few pearls of wisdom I have discovered over the past few years at school that you might want to incorporate into your arsenal of strategies to make the most out of your school experience. 1. First things first — congratulations — and take it easy on yourself! Take time and resources to rest up before classes start. Once they get going, semesters can seem very long. Give yourself the gift of good memories of downtime so that you have something to look forward to over your next break. Maybe write down some goals for the semester and make plans for self-care and stress management. One of the biggest challenges I have faced is finding school-life-work balance. True downtime will be scarce during the semester — you could always be studying! If you can afford it, invest in good-quality accessories that will help you succeed. A sturdy backpack for all those books and notebooks. Some good food storage solutions for carrying lunches and late-night snacks to the library. A home computer or laptop will be helpful (if not required), and your school bookstore may offer discounts on electronics to help with that cost. Explore alternatives to your school bookstore for procuring your books. Chegg.com is a good one, and there are others. Many times, though they may have good intentions, school bookstores may be overpriced. 2. Start your course of study with classes you have genuine interest or aptitude in — or that you enjoy! You may need to wake up those study skills. Enthusiasm will get you a long way, but the skills needed for school can seem different from those required by the workplace. You’ll thank yourself later. Why not start your new academic career on a confidence-boosting high note? I even took an entry-level composition course to get my academic research and writing skills warmed up my first semester back, and the experience was invaluable. 3. Access advising and think two steps ahead. If you are starting at a community college and you are not 100% sure where you want to transfer, monitor qualifications of schools you would like to attend and take classes common to them first. A little planning will keep doors open and prevent major headaches later. Also, check out career planning resources, or the great book Brand You by Kim Richmond. Never too early to start thinking about jobs! 4. Meet people and explore! One thing I found as an introvert is that going back to school really launched me out of my comfort zone. It’s an extrovert’s world. There are a ton of group projects, especially if you are studying business, and you’re going to learn about yourself and how you work with other people. It’s a great opportunity to make new friends. Sometimes, that can require effort if you’re used to life in the workforce, but it’s worth every ounce! The people you meet in your classes will be your coworkers and colleagues in a few years, and networking is everything. It is also a very good idea to create a smart social media presence and optimize your privacy settings. 5. Take advantage of everything available to you! And I’m not just talking about the free ibuprofen at the student health center — although that is a big one. As a student, you have access to many resources that you might not have access to otherwise. Would you believe my school (San Francisco State University) has a partnership with my mobile service provider? I get 10% off! You can often get major software packages at minimal cost while you are taking computer science courses — sometimes with a free upgrade later on! While in school I bought Windows 7 and Microsoft Office 2010 at a deep discount. Discounts on movie tickets, museum admission, and many, many other forms of entertainment and education. Want to learn the proverbial art of basket weaving? Want to do the tango? Swim the butterfly stroke? Take advantage of the non-academic offerings at school. These are all likely available as low-credit courses that may provide you with hobbies for a lifetime, while giving you a structured program for reducing school stress. I learned how to dance salsa and took two semesters to practice swimming! Speaking of swimming, you can likely use your school’s pool and gym facilities for workouts. Take advantage of free admission to guest panels, speakers and symposiums. Join a professional organization! 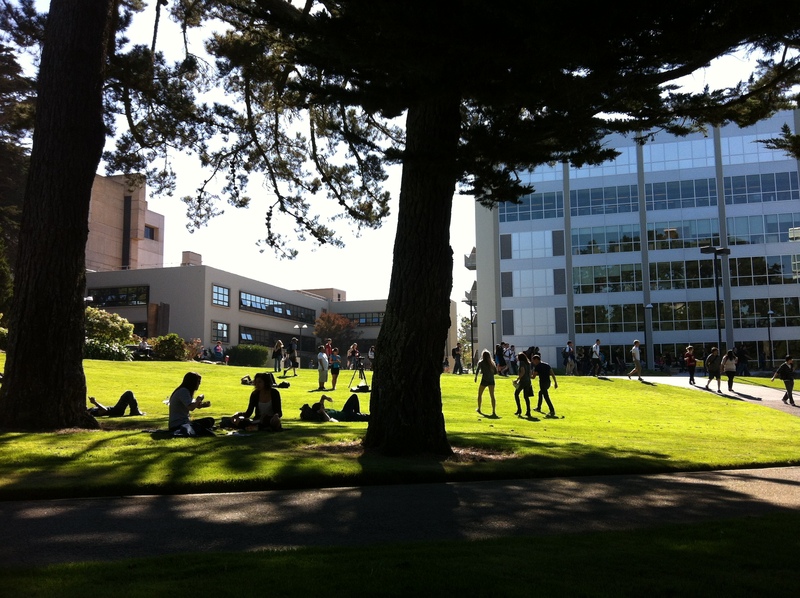 I just joined the SFSU Marketing Association, which offers dual membership in the American Marketing Association. I’ve been told over and over again that school is the time for informational interviews with people working in your field. They’re happy to meet with you for coffee to discuss what life on the inside is like in their profession — but after you graduate, you’re far more likely to be denied meetings because you may be perceived as a hungry job seeker. So get out there and talk to people, learn about the career you are working toward, and make the contacts that may eventually get you your dream job! Most of all — and I cannot stress this enough — HAVE FUN! Being in school is challenging, but it is also a blast. What have I omitted? Please feel free to keep me posted on your academic progress and share any tips that you’d like here in the comments section. Thank you … and thanks for sharing that excellent advice! I keep hearing about the services they provide … would you believe I haven’t been, myself? Thank you for reminding me to do that!